Ratings for Sunday's Oscar ceremony were down some in D-FW but up some nationally. Which means host Seth MacFarlane may not be history yet despite some heavy criticism of his jokes and bits. The three hour, 35 minute show averaged 40.4 million viewers compared to 39.3 million for last year's Billy Crystal-hosted ceremony. That's the biggest Oscar audience since 2010, when 41.7 million watched The Hurt Locker beat the mega-blockbuster Avatar for Best Picture. Sunday's Oscar-cast otherwise was the most-watched in the past eight years. The 2005 telecast had 42.1 million viewers. The 2013 Oscars also upped their percentage of advertiser-prized 18-to-49-year-olds by 11 percent. 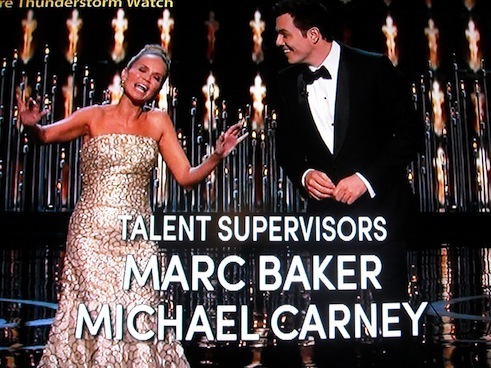 That was one of the main reasons the Academy and ABC went with MacFarlane. But it also helps to have a roster of popular pictures as nominees. And this year's telecast spotlighted hits such as Argo, Lincoln, DJango Unchained, Zero Dark Thirty and Silver Linings Playbook. The most-watched Oscars -- and a record not likely to ever be beaten -- were in 1998, when 55.2 million turned out. Not coincidentally, that was the year when the hugely popular Titanic won big. ***ABC has announced the celebrity hoofers for its 16th edition of Dancing with the Stars, which returns on Monday, March 18th. As usual, there are Olympians, a Disney Channel star, a pro football player, a goofball and a soap star. And yes, you read it right. Dance pro Maksim Chmerkovskiy is not participating this time. He says in a statement: "I'm going to take this time to dive into producing and acing, while fulfilling my sponsorship obligations."